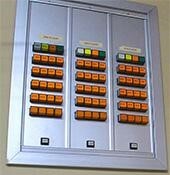 Do you have an aging nurse call system with buttons that look straight out of a low budget 1970’s science fiction movie? We know, it’s hard to justify throwing those out because they just keep on working – even though they lack some modern features you want. The problem is, your building is old, too – so retrofits that include running new network wiring to accommodate device upgrades is expensive and disruptive to your customers. Never fear, someone says – they can sell you a new wireless system with comparatively little disruption, but gives you the additional features you are interested in. It is pretty darn expensive, but not as expensive as running all new wires. Then your practical friend (we all have one) points out the volume of battery operated devices and troublesome considerations that come with a full wireless device solution. Now you are confused and frustrated and figure your chunky, plastic light up buttons on that giant, rectangular, space-hogging board of disco-era scifi are working, so why mess with it? Right? Your new interface. Color touchscreen! Honestly, you’re not wrong – you can keep making do. However, you’re not entirely right, either, because there is a great solution you haven’t heard of yet. If you want additional features, you can take advantage of your existing wiring with updated hardware (these will give you some additional features), be far more cost effective, and offer the ability to combine wireless devices where even more capabilities are desired. Everything will talk to each other through an intuitive main portal. Additionally, if your existing system is TekTone, all of the existing devices are backward-compatible through their Tek-BRIDGE server, so anything you want to keep can stay! Boom. That tingly feeling was your mind being blown. Take a second to recover, because there’s more. Besides the benefits of adding modern capabilities to your nurse call system, upgrades such as LED dome lighting will reduce maintenance and add new visual communication capabilities. Old fashioned pagers are still usable, but you may opt to replace them with connected devices (cell phones, tablets, iPods, etc.) that are cheaper to operate and replace and offer more information at a glance. 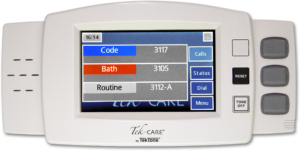 Patent tracking and emergency call pendants can be seamlessly integrated. Fire alarm and security can be integrated for notification purposes. The list of benefits is long! Contact us today to evaluate your nurse call system and give you an assessment of what can be done to bring you up to modern standards. We can help you and provide solutions to fit any budget.